The roof of an ice rink has collapsed in southern Germany, killing at least eleven people, including two children. Up to 50 people were inside the ice rink in the Bavarian Alpine town of Bad Reichenhall when the roof caved in under heavy snow, police said. Five bodies have been recovered, one person died in hospital and another five are known to be dead, police said. Blizzards were complicating the rescue effort although some 300 firefighters, police and soldiers are at the scene. The chairman of a local ice hockey club has told public television that a training session was cancelled after the local authorities warned the building was unsafe. "Ice skating for the public evidently still went on," Thomas Rumpeltes told ZDF television. An unnamed local official told Reuters news agency that the session could only have been cancelled so snow could be cleared from the roof but that measurements taken at midday showed that snow levels were within safety limits. Local schools are still on holiday and many children and families had gone skating. Parents near the ruined building called out the names of their missing children, reports the AP news agency. A helicopter shone a floodlight to help the rescue workers. A seven-year-old girl and a 12-year-old boy were among the dead, police said. In addition to injuries sustained in the collapse, rescuers fear some could be suffering from hypothermia after being trapped in freezing conditions. "The rescue work is proving very difficult. It is very difficult to get into the building. The roof which has collapsed can only be lifted with heavy equipment," police spokesman Fritz Braun said. The heavy snowfalls have led to huge traffic jams throughout the Berchtesgadener region, where a state of emergency has been declared, says the AFP news agency. The blocked roads are reported to be slowing down the arrival of rescue teams, although a 20-tonne crane has arrived, a local official says. "The situation is catastrophic," a Bavarian Red Cross spokesman said. Tents have been erected where the injured can be cared for. Soldiers moved people away from the area around the rink, while firefighters tried to lift off the remains of the roof in order to reach those trapped underneath. Police sniffer dogs were being used in the hunt for survivors. 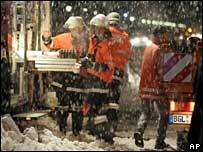 A rescue team from the Red Cross in Salzburg, 10km over the border in Austria, was also involved in the rescue. A local official said the accident happened just after the ice rink had closed for the day. Bavarian Governor Edmund Stoiber said he was "deeply shaken" by news of the accident. "Our hopes now rest with the rescue forces at the scene, who are doing everything they can," he said. Meanwhile, an avalanche in the nearby mountains has left at least two people dead, while another member of a skiing party is missing. Rescuers abandoned attempts to find the missing person overnight and feared the worst.